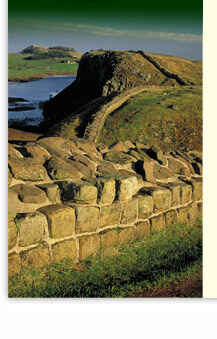 A warm Northumbrian welcome awaits visitors to Houghton North Farm situated adjacent to the Hadrian’s Wall Trail. The high quality accommodation is in bunk style rooms around the central courtyard and includes the use of a self catering kitchen where a light breakfast is served. There is also a well appointed TV lounge with internet access. Local amenities include village pubs, restaurant and shops in the nearby village of Heddon on the Wall. 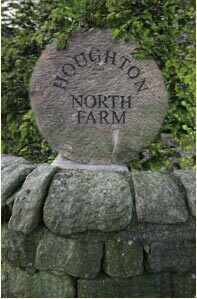 Houghton North Farm has been in the Laws Family for over a hundred years. Five generations of the Laws family have farmed North Farm. The farm was part of the Close House Estate; part of it will have been built with stones from the wall. The date on the Farm House is 1802 and on the farm cottages is 1815, although there has probably been some sort of farm here from earlier times. There is a little bit of wall with the Vallum running through Houghton, but it has not produced many artefacts even thought the land has been ploughed for many years. Earlier in the year Susie and William were playing out the back and found a round stone which we took to the Roman army museum to ask about it. It is a ballista for sling shot. Now they spend their time looking for more interesting finds, which has produced a lot of horse shoes from the time when horses were used to work the farm.